Picked from the Standard Liege tree at the fairly unripe age of 18, Chelsea’s young Nigerian centre-back is maturing faster than this birth certificate would suggest, as is beginning to look like a tasty bit of footballing fruit for football fans across the world to bite into sooner rather than later. Whilst yet to make his mark on the English game with Chelsea, it is outside England that he has demonstrated his true ability. In the club football sphere, he was farmed out to ADO Den Haag in traditional Chelsea fashion, with the Eredivise seemingly their favourite proving ground for youngsters on their books. It looked like a great fit for Omeruo, as he racked up 36 matches in the league last season, and was even involved in a very unique type of hattrick whilst he was there. Playing against VVV Venlo, the centre-back managed to not only score a goal at the right end for ADO Den Haag, but also to score an own goal as well, before picking up his 2nd yellow and getting sent off later in the match – a Dutch league first by any player. 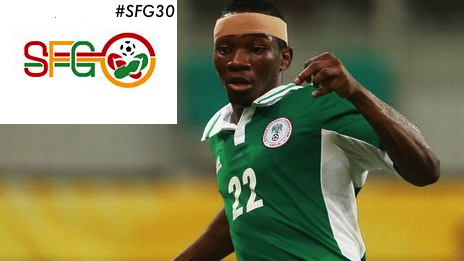 An undoubtedly impressive achievement (that perhaps would have only been made better had it been his debut that day), a genuine Officially Recognised By FIFA accomplishment occurred later that season, as he provided the rearguard action during Nigeria’s 2013 African Cup of Nations win. Playing in every single match of the tournament, he was integral in a tournament victory that was arguably more famous for defensive performances over their goalscoring ability. Highlights such as nullifying the Ivory Coast’s infamous strike power were vital in the quarter-final before seeing off an impressive Burkina Faso side in the final – and all before he hit the age of 20. Further expanding his caps collection in the Confederations Cup to 13, Omeruo will most certainly be the rock of Stephen Keshi’s side for the foreseeable future. Described as reminiscent of a young William Gallas by Chelsea expert Joe Tweeds (@JoeTweeds), it would seem that you may have to pay a bit extra if you want to post Omeruo to someone – as he’s got the full package. A powerful defender complemented by decent pace, he fits well with the modern day imagination of the centre-half, and has the natural footballing instincts that are rare to see at such a young age. Whilst the Dutch league may not always be of the highest quality in recent years, calls for another a “toughening up” in England’s lower leagues, or a similar cliche, was answered by the loan spell at Middlesborough he is currently on. Whilst Chelsea do not exactly have the best record for youth promotion, I have no doubts that his international experience will be of great attraction to a club elsewhere in the same league.